Note: As you may have seen in my previous post, I recently declared my intention to vote for Hillary Clinton in the Democratic Primary. I feel good about that decision, but I know a lot of people that I like and respect wound up coming to a different conclusion. One such person is my former Obama London co-chair Rob Carolina, who became Chair of Democrats Abroad during my second term as Vice-Chair of that organisation. Rob is not only a very smart guy but also a good friend. For that reason I wanted to give him the opportunity of representing the many thoughtful and dedicated Democrats I've spoken to this year who are Feeling the Bern. I voted for Bernie Sanders in the Democrats Abroad Global Primary. I feel it's important to explain my reasons to the many friends I made within the Obama campaign and Democrats Abroad UK. Like everyone in the Democratic Party, I found myself confronted with two very competent, experienced, and viable candidates for the office of president. Secretary Clinton's accomplishments are many. Her wide experience includes the White House, the US Senate, and the State Department. A talented lawyer, over her years of public service she has taken each brief, mastered its complexities, and delivered positive results. 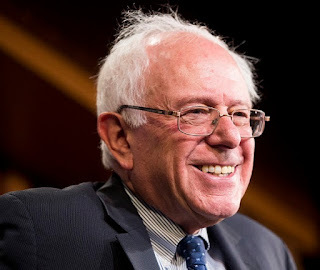 Senator Sanders, in contrast, has spent a large amount of his time in politics as an isolated voice advocating the merits of democratic socialism. He spent decades warning of the consequences of America's emerging winner-take-all culture and the slow drift away from the New Deal crafted by President Franklin D Roosevelt in the 1930s. This distinction is the key to my decision. Our nation, and the grand experiment begun at its founding in the 18th Century, faces a new existential crisis. Our country increasingly resembles the dysfunctional countries that my late father visited as the international finance director for a large US multinational firm in the 1970s. Returning to our Midwestern suburban house from trips abroad, my father (a life-long Republican) would often lament that the society he had visited was "one of those places where 1% of the people own 99% of everything". He felt there were few good prospects for such places where the vast majority of the population was virtually powerless. He celebrated the America that he knew – as a World War II veteran, beneficiary of the GI Bill, and Ohio factory worker who moved from his blue-collar assembly line job to a senior management role – as a more equitable society with meaningful prospects for social mobility. Four decades after my father's international travels, and two decades after his death, many of the places he visited have made tremendous strides in building a middle class and strengthening democratic institutions. In that same time the United States has also changed. A small circle of the truly rich have grown more distant from their fellow Americans while accumulating for themselves a massive increase in the percentage of our nation's wealth. We have more or less abandoned any pretence of asking people to consider "what you can do for your country". We've adopted a winner-take-all approach to every aspect of our lives and careers, providing ever-growing rewards to an ever-diminishing group of "winners", while classifying anyone who fails to reach the top of the pyramid as a "loser" – saddling them with crushing student debt, or crushing medical debt, or both, and with no viable opportunity to try again. The social safety net that remains is so filled with holes, and exists so close to rock bottom, that even people who are caught in its grasp often do not survive the fall. I've already attended the funeral of one friend from my generation (Generation X) who was crushed by our society's newfound heartlessness. I've read the obituaries of others. One of the most important jobs of the President of the United States is to offer a hopeful vision for the future of our nation. The successful candidate must then rally our nation, move closer to that vision, and defend that vision against those who wish to deny us that same dream. This ability to offer a compelling vision is what distinguishes great leaders from great managers. As many others have written, Dr Martin Luther King, Jr captured the national imagination and changed the political landscape by proclaiming, "I have a dream." He did not announce, "I have a plan". This is the difference between leadership and management. Leaders inspire our collective devotion to reach the promised land, even if they don’t yet know how or when we will get there. I have no illusions that any Democratic president taking office in 2017 will have the magical ability to sway the US Congress into some semblance of rationality or even reasonability. President Obama began his time in office attempting to find accommodation with the Republican Caucus. This is one of the many reasons I supported him. But he was rebuffed time and again by those who engage in hostage-taking politics. Witness the recurring threats of falling from fiscal cliffs, the resulting downgrade of US sovereign credit rating, failure to hold confirmation hearings for multiple executive branch appointments, and a growing logjam of judicial appointments that wreaks havoc with our criminal and civil justice systems. President Obama discovered that he was not negotiating with a disciplined and principled group of people sharing a core of common values. Rather, he found himself sitting opposite an unruly mob who were uninterested in compromise and happy to allow harm to our nation for the sake of personal political expediency. His negotiating tactics changed. The new reality demanded a harder line, and our president moved to take it. Any Democratic president taking office in 2017 must be prepared for the worst political ride in US history. But to make a difference, that president cannot fail to keep faith with the core values that carry them into office. Our current national nightmare of unprincipled gridlock caused by unprincipled demagogues will only come to an end when the Republican Caucus decides to clean its own house, bringing a renewed vigour to discussing the health of our nation as a whole – or when it is replaced by something else. It will not be fixed by more rigorous discipline within the Democratic Party. Nor will it be aided by a policy of "triangulation" that merely confuses the inequitable with the inevitable. Senator Sanders has spent his career giving voice to a vision for the future of America. When he started, this was a message that most Americans were not ready to hear. In those days, the most pressing existential threat to America was the Cold War and the potential for nuclear annihilation. Most of us at that time simply did not have a clear sense of the economic and social future of our country and the long-term damage that was about to be created by the "Reagan Revolution". Americans of my generation, born in the mid-1960s and 70s, have witnessed both the birth of Reagonomics and the terrible toll that it has taken on our society. American generations younger than mine are also worried about the bleak prospects for their future. They are right to worry. It's been a rough ride for my generation. It is already worse for theirs. The key to winning a presidential election is not only mobilising the base of one's own party. It is equally important to persuade outsiders. What America needs is a political leader for all of the people of the United States. Yes, someone who can rally the support of the Democratic base by demonstrating adherence to our shared set of values. But also someone who can gather support from the growing plurality of Americans who do not identify strongly with either major US political party. A vast and growing part of the American population has begun to fear, with justification, that their future is bleak. That those comfortable with the status quo are leaving them behind, voiceless and unprotected. That their concerns are ignored by the establishment represented by both major US parties. An America with little hope for the future is not America at all. Donald Trump has already exploited this fear to drive a wedge through the heart of the Republican Party. Mr Trump's powerful appeal to the powerless can only be defeated by a passionate, intrepid champion with a better inclusive vision for America's future. Unless we promote a candidate who can passionately advocate a vision that restores this same hope of an America in which everyone can enjoy a better future, then we have failed to lead and we risk failure at the polls in November. This is not the time to move to the centre. We are at one of those turning points in history where, as Yeats wrote, "Things fall apart; the centre cannot hold." We (as a party) must confront the reality that this is not merely an election of left versus right as we traditionally define these terms. The "centre" of that 1-dimensional axis is a political desert. A place that exists on a map, but nobody lives there. Here now is the new American politics. Those who can articulate and respond to the fears (and hopes) of the rising tide of the powerless and politically unmoored will find success in our democracy. Those who believe that the simple left-right labels continue to define us as a nation will struggle as this once accurate barometer no longer forecasts the political weather. Nine years ago when I started my support for Barack Obama, foreign observers who had lived in the US in the 1970s and 80s told me with confidence that America could never elect a black man as President of the United States. As we saw in 2008 and 2012, America has changed. Today some tell me that America will never elect a president who openly promotes a vision of democratic socialism. (They seem to ignore that we already did this in the 1930s, 40s, and 60s.) I agree that in the 1970s, 80s, and 90s, America was not ready for a president like Bernie Sanders. But once again, times have changed. America is ready for Bernie. So am I.
P.S. In voting for Bernie, I find myself (for the first time in many years) disagreeing with my good friend and Obama London Co-chair, Karin Robinson. Karin has already written a heart-felt article about her choice to vote for Hilary Clinton. I respect her views, as always, and thank her for consenting to my request to publish this essay here on the same pro-Obama blog she founded so many years ago when we first campaigned together.